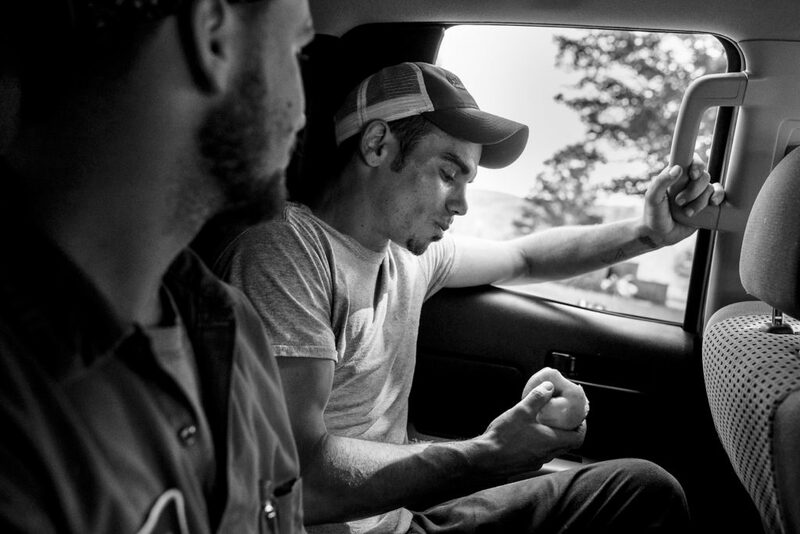 Editor’s Note: The images in this series were taken by West Virginia photographer Rebecca Kiger at Jacob’s Ladder, a residential addiction recovery program run by Dr. Kevin Blankenship in the rural community of Aurora, West Virginia. 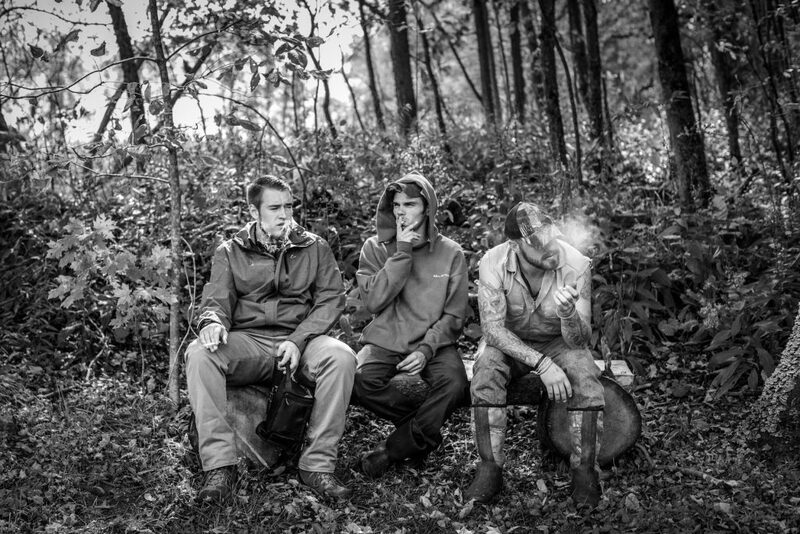 The men featured in the photo series attended the farming-based rehab center and are the subjects of the 2018 feature-length documentary “Recovery Boys,” directed by Academy Award nominee and West Virginia native Elaine McMillion Sheldon. 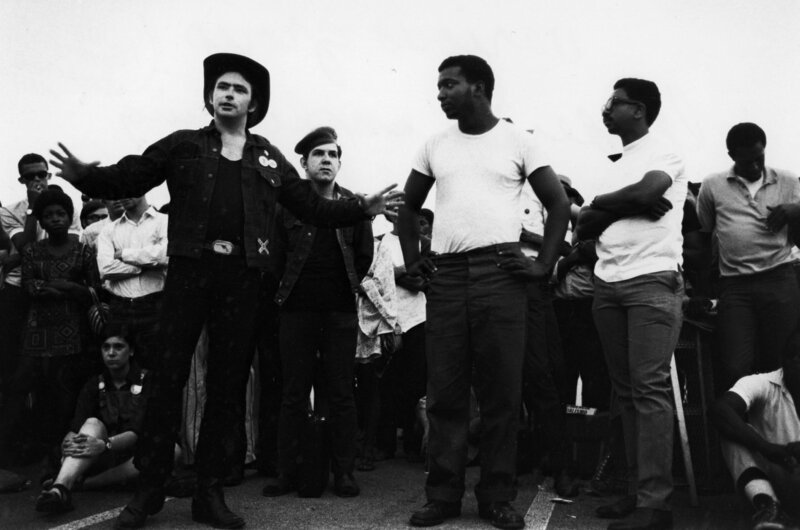 “Recovery Boys” can be viewed on Netflix and is available for community screenings. 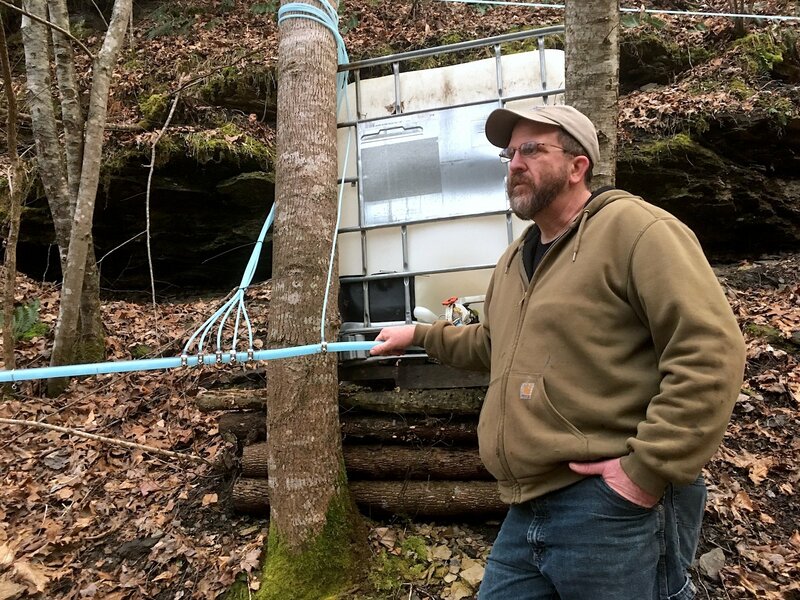 “Jacob’s Ladder at Brookside Farm is a six-month residential addiction recovery program started almost three years ago in response to the growing health crisis facing our nation and in particular my home, West Virginia. Ryan walks through a building being remodeled to house additional residents at Jacob’s Ladder. Photo by Rebecca Kiger. 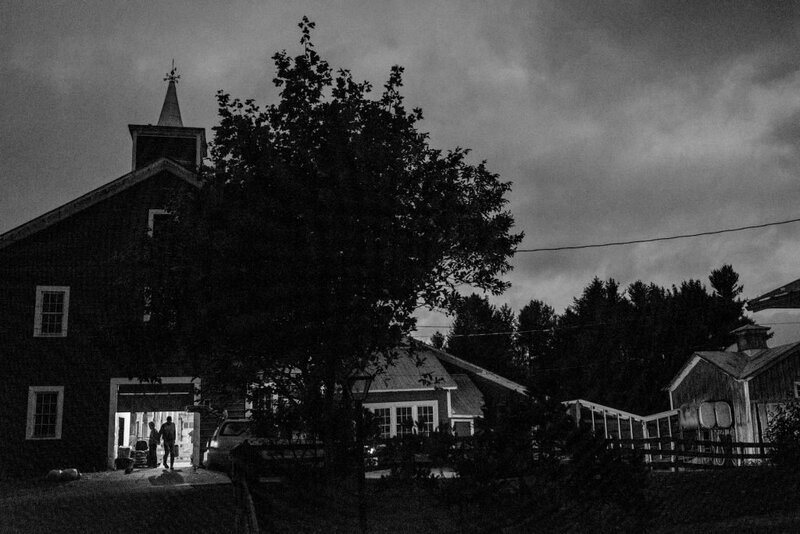 Dave and Adam enter the barn to begin predawn farm chores. The Utterback family farm sits adjacent to Jacob’s Ladder. The Utterbacks work closely with the young men in the farming portion of the recovery program. Photo by Rebecca Kiger. 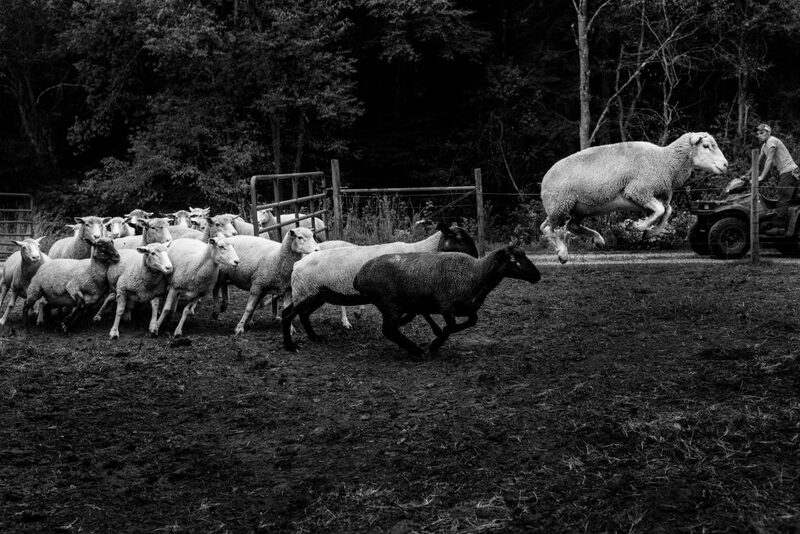 As Jeff herds sheep into the barn, one leaps from the flock. Photo by Rebecca Kiger. 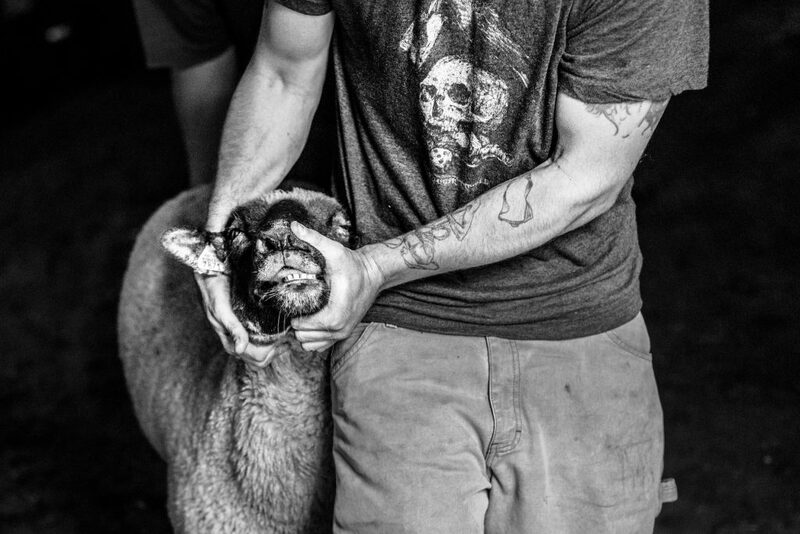 Ryan wrangles a sheep for hoof cleaning. Photo by Rebecca Kiger. 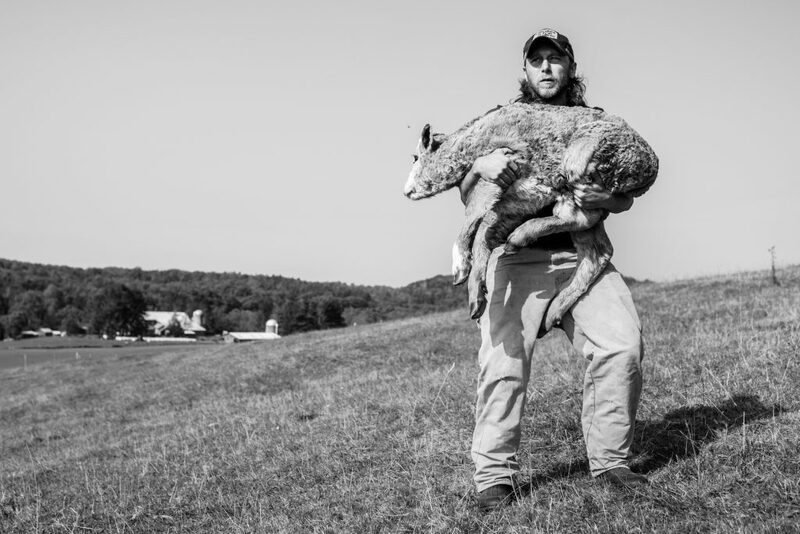 Ryan carries a newly born calf to its mother after they were separated moving cows from one pasture to another. Photo by Rebecca Kiger. 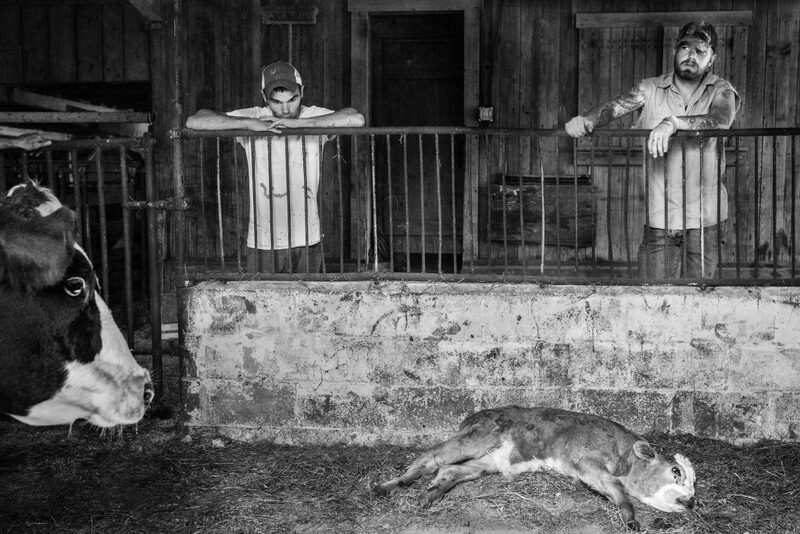 The baby calf surrenders to an early and unexplained death while Jeff, Rush and the calf’s mother look on. Photo by Rebecca Kiger. Sutton, Jeff, and Rush take a smoke break on a bench outside of the residential facility. Photo by Rebecca Kiger. Farmer Mark Utterback, Ryan, and Adam gather potatoes in the fall. The potatoes are just one item of produce harvested from the first gardens planted by the men in recovery at Jacob’s Ladder. The food is used in the meals they collectively cook for one another. Photo by Rebecca Kiger. 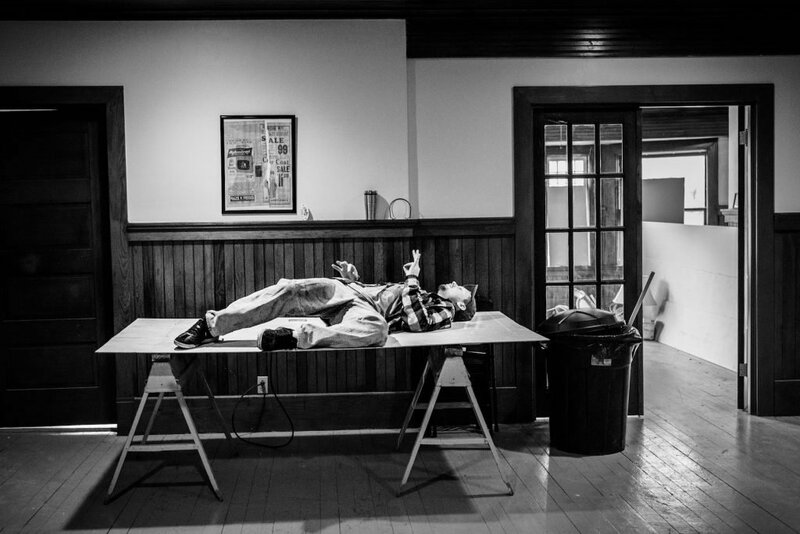 Adam reclines across a makeshift table in a home being remodeled on the property. Photo by Rebecca Kiger. After long hours of work, Jeff eats an apple collected from the farm on the ride back to Jacob’s Ladder. Photo by Rebecca Kiger. 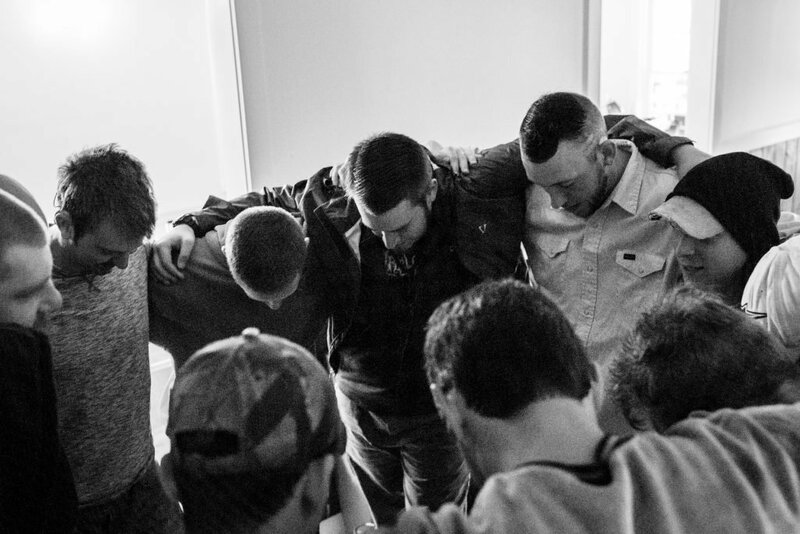 The men in recovery embrace one another while gathering in the living room at Jacob’s Ladder. Photo by Rebecca Kiger. Jerrica, Dr. Blankenship’s daughter, leads the men through yoga on the front lawn of Jacob’s Ladder. 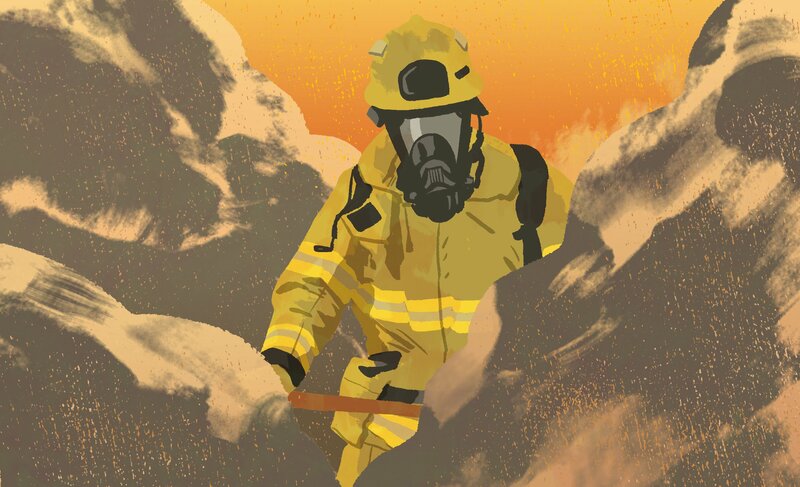 The facility embraces a holistic form of recovery by incorporating art therapy, music therapy, exercise, farm work, construction work, community service, frequent twelve-step meetings, and meditation. Photo by Rebecca Kiger. 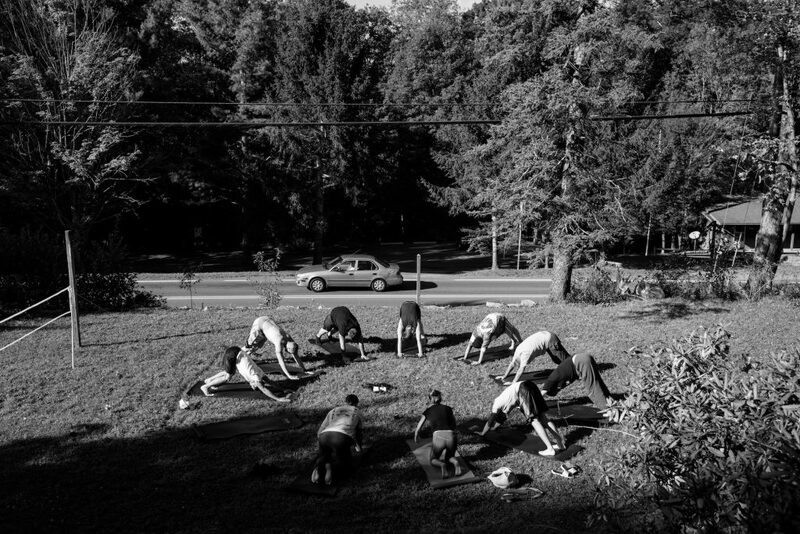 Dave raises his hands during yoga practice on the front lawn of Jacob’s Ladder. Photo by Rebecca Kiger. Rush tends to the chickens at the Utterback farm. The henhouse is moved regularly in order to fertilize the farmland and maintain healthy soil. The eggs are gathered, sold, and used for meals at Jacob’s Ladder. Photo by Rebecca Kiger. 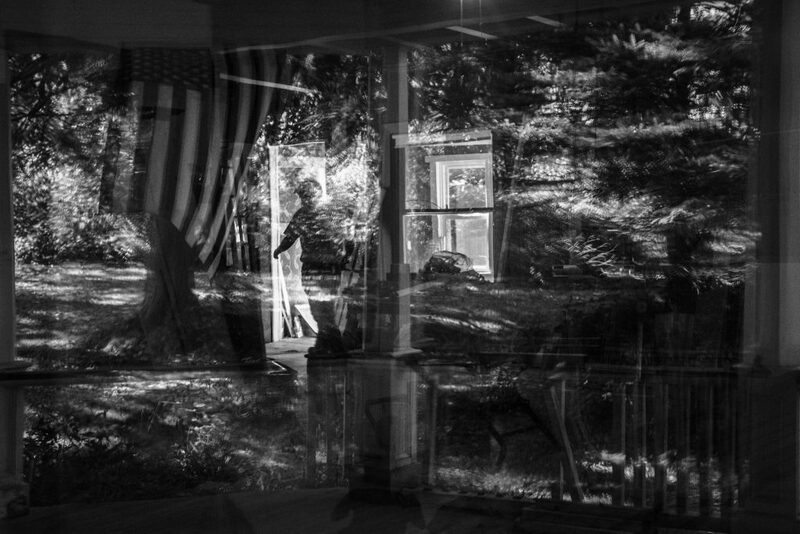 This series was originally published by 100 Days in Appalachia. 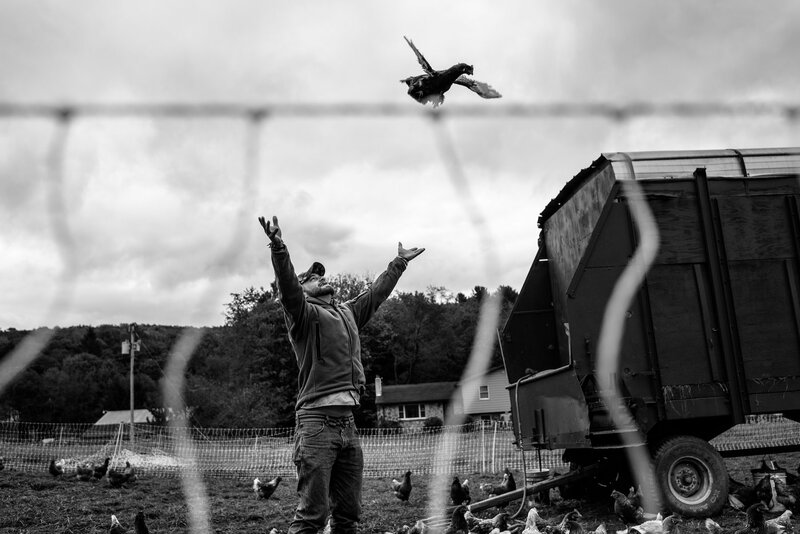 Rebecca Kiger is a documentary and portrait photographer living in West Virginia. 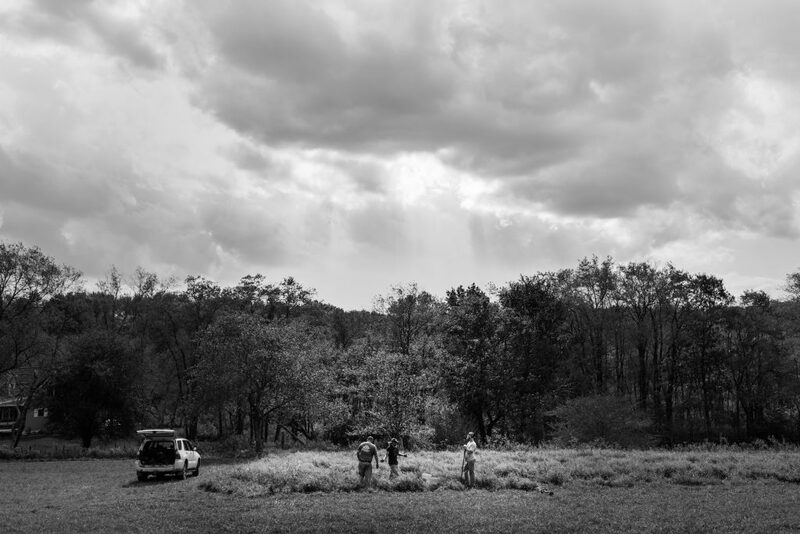 Her work has been published on the Lens blog, TIME magazine, Vox, Everyday Rural America and Looking at Appalachia. In 2018, she received the Edward R. Murrow Award for Excellence in Video. Rebecca has been selected to be a ‘Teaching Artist’ through the Rural Arts Collaborative (RAC) for the next academic year at Bellaire High School, Ohio, where she will work with students on a year-long photography project. She is currently photographing stories about foster care and adoption.